There is accumulating evidence that the metabolism of several trace elements is altered in diabetes mellitus and that these nutrients might have specific roles in the pathogenesis and progress of this disease. 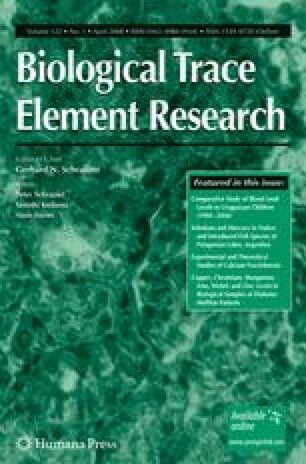 The aim of present study was to compare the level of essential trace elements, chromium (Cr), copper (Cu), iron (Fe), manganese (Mn), nickel (Ni), and zinc (Zn) in biological samples (whole blood, urine, and scalp hair) of patients who have diabetes mellitus type 2 (n = 257), with those of nondiabetic control subjects (n = 166), age ranged (45–75) of both genders. The element concentrations were measured by means of an atomic absorption spectrophotometer after microwave-induced acid digestion. The validity and accuracy was checked by conventional wet-acid-digestion method and using certified reference materials. The overall recoveries of all elements were found in the range of (97.60–99.49%) of certified values. The results of this study showed that the mean values of Zn, Mn, and Cr were significantly reduced in blood and scalp-hair samples of diabetic patients as compared to control subjects of both genders (p < 0.001). The urinary levels of these elements were found to be higher in the diabetic patients than in the age-matched healthy controls. In contrast, high mean values of Cu and Fe were detected in scalp hair and blood from patients versus the nondiabetic subjects, but the differences found in blood samples was not significant (p < 0.05). These results are consistent with those obtained in other studies, confirming that deficiency and efficiency of some essential trace metals may play a role in the development of diabetes mellitus.